Photo courtesy of The Gaussen Database. 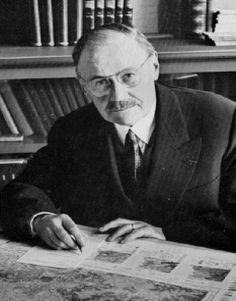 The author of nearly five hundred books, articles, and maps, Gaussen was one of the mid-twentieth century's most outstanding plant geographers. After taking his Ph.D. at the University of Toulouse, he continued on at that institution for most of the rest of his life, focusing his research efforts on French biogeography, agriculture, vegetation, ecology and forests, and on the evolutionary biology of gymnosperms; he also did work in economic geography, climatology, and botany. Gaussen's name is especially connected with Pyreneen studies. His professional connections included directorship of the Registry Vegetation of France, presidency of the Commission Française de Cartographie, and membership in the Academy of Sciences, Paris, and the French Academy of Agriculture. --born in Cabrières d'Aigues, Vaucluse, France, on 14 July 1891. --dies at Toulouse, France, on 27 July 1981.